It's also GAPS-compliant thanks to the use of green lentils instead of traditional beans. A unique but delicious (and healthier) twist for these cooler nights. While I always prefer to soak nuts and legumes, I find that soaking lentils prior to cooking is not always necessary. If you do decide to soak the lentils, decrease the broth by 1/2 cup since the lentils would have absorbed some liquid during the soaking process. I prefer using French green lentils for several reasons. First, they are much smaller than other lentil varieties and hold their shape extremely well. These morsels are full of bold, peppery flavor — making them a prime choice for chili! Chili is awesome because you can boost nutritional value by sneaking in surprise nutrient-dense ingredients such as grated liver or, in this case, pumpkin purée. Totally optional, but since we're officially in fall, this chili is asking for a hefty dose of the seasonal gourd. I promise it will be undetectable, yet adds nutrition. If you choose to skip it, no need to make other accommodations, just proceed with recipe as listed. I make this chili in my Instant Pot — an amazing time-saving resource. After sautéing, throw everything in the insert pot, set it to cook, and leave it alone until finished. It doesn't get any easier than that! This recipe takes 30 minutes (counting prep and cook time) but be sure to leave some wiggle room because your pressure cooker will need a few minutes to come up to pressure, and de-pressurize, too. 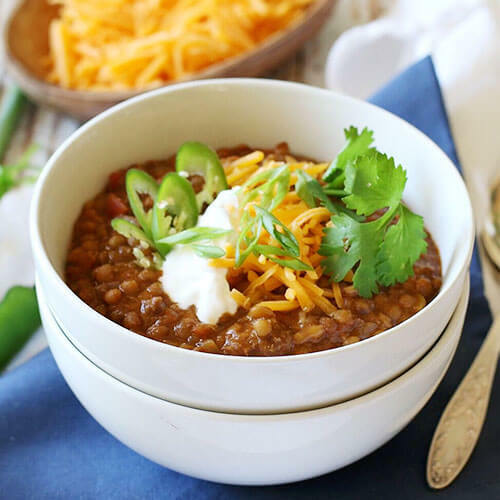 Break out your pressure cookers to make this healthy fall and winter recipe: Instant Pot Green Lentil Chili! It combines three of my favorite things: hearty soup, easy dinner, and chili seasoning. You can make the best Paleo and GAPS-friendly homemade meal ever in just 30 minutes, then top with cilantro, sour cream, or avocado, and dig in! If using an electric cooker such as the Instant Pot, press the "Saute" function. If using a stovetop cooker, place on burner over medium heat.Wait until hot. Add fat of choice to insert pot. Add diced onions and sauté for about 5 minutes, or until translucent. Add minced garlic. Give it a quick stir. Add ground beef. Break it up into smaller chunks. Turn off (if electric cooker) or remove from heat (if stovetop cooker). Add rest of ingredients in order they are listed. Stir to combine. If using an electric cooker, set to high pressure for 20 minutes. If using a stove-top cooker, bring to high pressure and maintain for 20 minutes. When cycle is complete, turn off (if electric cooker) or remove from heat (if stovetop cooker). Either quick release pressure or let sit until pressure has naturally released. Once pressure is released, open lid and serve. Enjoy chili with your favorite fixings, such as sour cream, cheddar cheese, green onions, cilantro, and avocado. 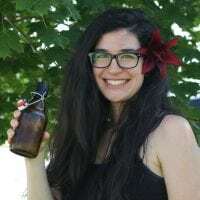 Eat as leftovers the next day, and in thermoses for lunches! It's also a great freezer meal. 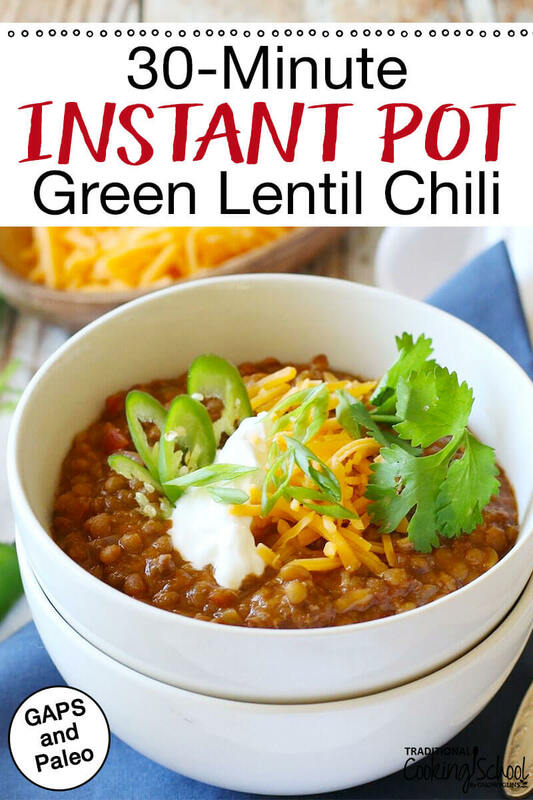 How would you top this Instant Pot Green Lentil Chili? We love sour cream, raw cheddar, cilantro, and fresh serrano peppers. This sounds great! I have been craving chili but am on GAPS, so I decided that it just wasn’t going to happen. I never thought of using lentils! ? Is there an error in the recipe where it says, ‘reduce by 1/2 if not using soaked lentils’? Seems that if you are not using soaked lentils you should not reduce the liquid. Pickled jalapeño slices are yummy too. No need to sauté veggies, the Maillard reaction happens automatically in the IP ? The only thing I even brown is hamburger or bulk sausage, just so I can break it up. Roasts, etc don’t need browning either. Love my InstaPot! I fill a big bowl at least halfway, more for me, with baby greens before putting in hot chili. They wilt and are nicely flavored w/the spicy chili. Kids don’t LOVE it but they readily eat it. I rly like it! This chili is great. Stormy weather here right now and just fell like making something ahead for lunches this week. Instead of pumpkin puree, I used sweet potato cut up quite small. Very pleased. Thanks for sharing. I’m confused. The directions say to reduce the liquid by half if NOT using soaked lentils. Shouldn’t that be the other way around? So, is the 4 cups broth for soaked or unsoaked lentils? After adding the ground beef, is it supposed to be browned before adding the other ingredients? Also, do you reduce the broth by 1/2 (2 cups) or by 1/2 cup, which is what it states above the recipe in the “To Soak Or Not To Soak?” paragraphs. Should I brown the ground beef before I add the other ingredients? What would you suggest as a substitute for the ground beef to make this a vegetarian dish?